Hull City Council’s Planning Committee has given the green light to a £22m scheme by Wykeland Beal, which also includes a 350 space multi-storey car park, 34 residential units and 3,000 sq ft of retail/leisure space. The development will see Arco, the UK’s leading safety company, return to its roots in the Fruit Market where the business opened its first shop in 1893. The five-storey office building demonstrates Arco’s continued investment into the city and its support of the regeneration of the Fruit Market to ensure Hull remains a vibrant and commercially successful city. Joining its digital team already based in the area, the new office has been designed to enhance the existing environment and blend with the current architecture including the @TheDock tech campus and its centrepiece building, C4DI. 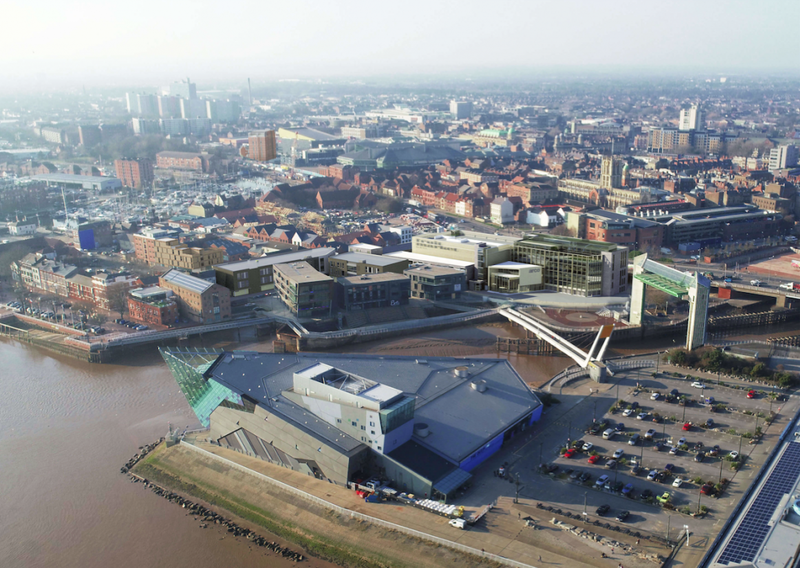 A computer-generated image of the new head office building for Arco, which will have views of the River Hull, The Deep tourist attraction and the landmark Hull Tidal Barrier. The offices are part of a wider development approved by Hull City Council’s Planning Committee. Wykeland Beal, the joint venture company driving forward the regeneration of the Fruit Market in partnership with Hull City Council, worked closely with Arco to develop the plans for the new head office and submitted the successful planning application. The development, on a site between Blackfriargate and Humber Street currently used as a temporary car park, is the latest major element of the £80m transformation of the Fruit Market waterfront quarter into a thriving urban village. Dominic Gibbons, Managing Director of Wykeland Group, speaking on behalf of Wykeland Beal, said: “We’re delighted this landmark scheme has gained planning consent. 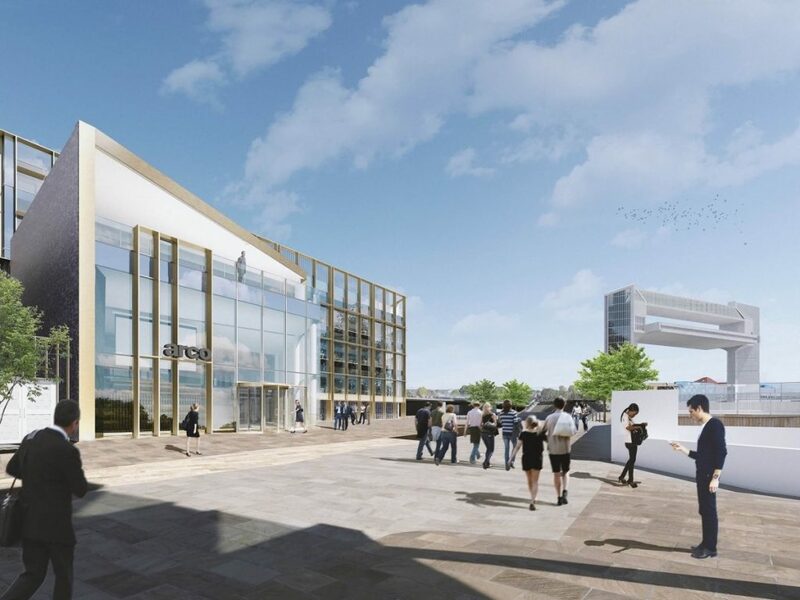 “As well as securing Arco’s future in Hull in a showpiece new head office, this development paves the way for further investment in residential, retail and leisure space, all adding to our ‘live, work and play’ vision for the Fruit Market. The multi-storey car park will also be a vital asset, supporting Arco and its employees and the growth of the area as a magnet for business investment and visitors. With a contemporary look, social meeting areas, a glass fronted atrium and an auditorium for staff and customer presentations, Arco believes this move will reinforce its positioning as a leading local employer and attract new talent to the company. An aerial view of Hull’s Fruit Market area and waterfront, showing how the latest development including Arco’s new head office will look. The image also shows buildings recently given planning approval as part of the completion of the @TheDock tech campus. 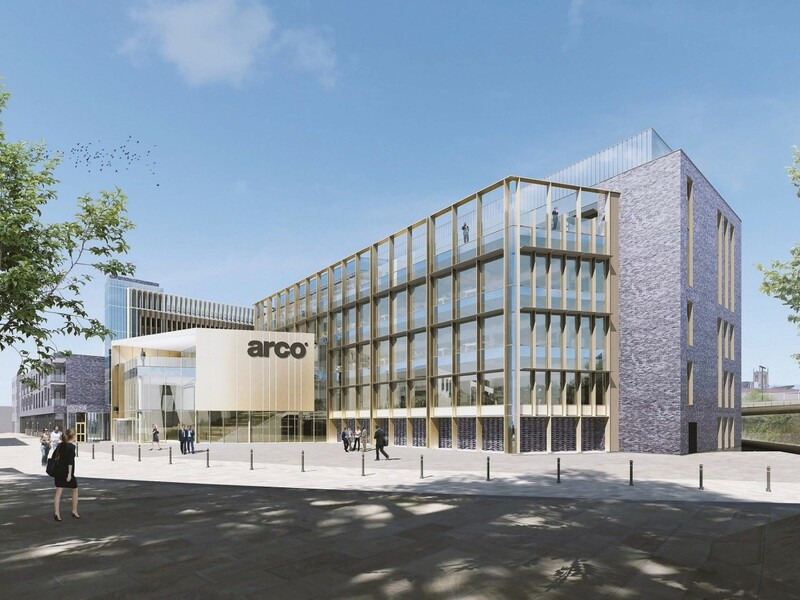 Construction of the 55,000 sq ft head office building is due to begin this summer, with the aim of approximately 450 Arco staff moving in by the end of 2020. Building work will begin at the same time on the multi-storey car park, which will offer a mixture of contract and pay and display parking. With the creation of a second National Distribution Centre (NDC) on Clive Sullivan Way and substantial investment in digital technologies, Arco is investing to ensure the long-term future of the business and maintain its base in Hull, providing continuity for its 900 colleagues who live in and around the city. The regeneration of the Fruit Market is creating one of the most vibrant and fastest-growing communities in the North of England. An area which was largely derelict just a few years ago has been reinvented as a thriving commercial, creative and cultural community, with the first buyers now moving into a high-quality residential development. The latest investment will bring more than 500 office, retail and leisure jobs to the waterfront area as well as a large number of jobs during the construction phase. Councillor Daren Hale, Hull City Council Portfolio Holder for Economic Investment and Regeneration, said: “Arco moving its head office and 450 staff to the Fruit Market will be a significant boost to the area and all the fantastic businesses that operate there. “The relocation is a major part in our long-term vision for the city centre, key to both the regeneration and investment that continues to take place in the Fruit Market, as well as the vital Castle Street works.